Welcome to the home page for the Park and War Memorial. Here you will find information about the site, its ongoing development and ways to get involved. Over the last couple of months, four living sculptures have appeared in Hednesford Park. In November 2016, essential tree works commenced on the tree avenue where sixteen, large, mature trees were felled. Some of these felled trees have been used and turned into beautiful woodland art pieces. Robot Cossey, an artist from Wolverhampton who is well known for his timber sculptural works has completed the first four sculptures which now take pride of place in the park. These include an owl, a lizard, a squirrel and a woodpecker. A further four sculptures will be added to this collection over the next few months. Can you help? We would like to know what other woodland and park creatures you would like to see in the park. Presently the Park encompasses a range of facilities including children's play area, skateboard park, refurbished tennis courts, football pitches and pavilion with changing rooms. There are mature trees and shrubs and masses of open spaces for users to relax in. There are Park Keepers on duty during the park opening hours. 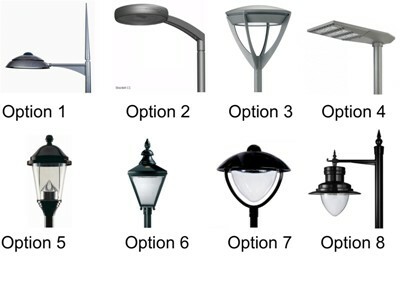 We are looking at different types of lighting for the main access path through the park. Given that the park was opened in 1932 we are searching for a suitable style that reflects this period or adopt a more contemporary style reflecting the improvements being made now. As such we would appreciate your preferred choice and/or feedback on the styles shown below to allow us to select a style and produce an appropriate detail for the park. We are looking to install new benches throughout the site as well as litter bins. 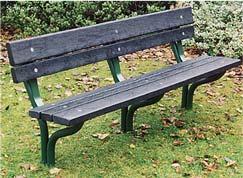 An example of the proposed bench is shown below, this would be a steel frame painted black set into a paved area and with recycled plastic 'timber' boards. We would appreciate your comments on the design via email address bleow. Litter bins would be to the standard tall square design, painted black with gold bands. Details of progress on site can be found on the Sites Works section. Tenders for the restoration of the gates and fencing to Hednesford War Memorial have been published. All tenders are let through Staffordshire County Councils e-procurement system. The open day for potential cafe operators was quite successfull with a wide range of people interested. Tenders for the lease will be issued in April. Tenders for the fencing works are due to be returned very shortly whilst tender for restoration of the war memorial iron work will be issues in the next week or so. The play area contractor is working up final detials following further consutations with local schools. The tender for the pavilion refurbishment has been published. All tenders are let through Staffordshire County Councils e-procurement system. The open day for operators interested in the proposed cafe will be on Tuesday 10th March from 11am to 3pm in the exiting pavilion in the park. Plans of the proposed refurbishment and staff will be on hand to discuss any queries. The Council is seeking Expresions of Interest for the operation of the new cafe that will be built within the refurbished pavilion. Cannock Chase council is currently working with the design team on the final stages of a detailed design for the café building in the refurbished pavilion at Hednesford Park . It is anticipated that the tender for building contractors will go out in March 2015 with completed tenders returned late April 2015. This will be followed by a period of evaluation and appointment and it is planned to open the café in October/November 2015. It will be up to the chosen café operator to work with the client team to agree a layout so that the café can be a thriving business in the park. The server/kitchen area will comprise food preparation worktops with associated electricity and water supply. There will also be a telephone line. All lighting, heating and ventilation will be provided. Floor, wall and ceiling finishes are currently being specified. All services will be metered separately. The council will be organising an open day in Early March 2015 when interested parties can see the café space and plans for the refurbishment. The 'hard works' contract for car park and access roads is progressing steadily although a little behind schedule as it was hoped to have the car park and Rugeley Road access in use by Christmas. This should be opened up for use very soon. Apologies for the delay. The contractor appointed to design the play areas is now working up details which will be subject ot a brief final consultation, including some local schools, before agreement on the final detail. If all goes to plan then the new play areas should be open by early August this year. A few people have asked why the play area is being moved. There are several reasons for this, the main one being to centralise all activities around the new refurbished pavilion rather than spread across the whole site, to focus use back onto the pavilion and make that the centre of the park as it originally was. It would also allow parents to be able to use and sit outside the cafe and keep an eye on their children whilst they play. It would enable users of the play area easy access to welfare facilities, which previously reuired a long walk across the park for all the family. The tenders process for works is a two stage process operated via Staffordhsire County Council's e-procurement system. Presently Stage 1 tenders (Pre Qualification Questionaire) are open for Fencing to the Rugeley Road boundary of the park. We are into Stage 2 (Invite to Tender) tendering for the skate plaza and also the War Memorial restoration. The tender for the pavilion works has been delayed whilst agreement is reached on specifications and costings. As part of the Heritage Lottery Fund Bid we had to carry out detailed research on the history of the site and this part of one of the main documents within the bid called the Conservation Management Plan (Download from below). This plan not only details the history of the site but covers how the site is used and managed today, the risks and opportunities, the proposed enhancements and future management. It is full of pictures of the park and war memorial from when they were built up to today as well as containing many maps and plans. All giving an interesting view of how we worked and played in the past and well worth a look. If anyone has any information on the sites history or even their own stories or involvement with the park and war memorial, especially pictures then please let us know. Does anyone know when and exactly what the brick building was/looked like that was to the right of the entrance way of Victoria Street and close to the paddling pool - has anyone any picture of the pool? The council has successfully obtained a Heritage Lottery Fund Grant of £2.2M as part of the improvements to the park and war memorial. This is supported by match funding from other organisations and partners including the Council, Staffordshire Environmental Fund & St Modwens. Further funding will be sought as the whole park project develops. The bid was based on the Masterplan that was developed through consultation and can be viewed here. The project will take several years to complete. This programme is subject to change but we will be keeping you up to date on site works on accompanying pages as and when they progress. In December 2013 planning consent was granted for the various works that required consent. A small amount of work to the war memorial will require Listed Building Consent and an application will be made for that shortly. Following completion of the Tennis Courts there has not been a great deal of activity on the site, however a great deal of work is being carried out behind the scene in terms of organising and detailing all the necessary works. Regular updates can be found on the Site Works section below. Junior & Toddler Play Area, Senier Play Area, Skate Park, Pavilion refurbishment, Park fencing & gates, War Memorial restoration & improvements and Park Planting. There will still be updates on this page regarding small or odd pieces of works that do not fit anywhere else. Apologies for the long silence, however we have been quite busy behind the scenes sorting out varous contracts for the proposed works. The good news is that a contractor, Horticon Ltd., has been appointed appointed to carry out the Hard Works contract - new access road and footpaths, extension of the car park, resurfacing of the existing car park and widening of the access way onto Rugeley Road. The works are due to commence on Monday 20th October and the first phase will run until March 2015. Unfortunately the first stage involves widening the access way onto Rugeley Road and sorting out the car park area. This work will necessitate to closing of the access point and car park for 6 weeks from the 20th October. If possible we will shorten this as much as we can. The works also included for resurfacing of the access way up to the War Memorial. However as we are running behind schedule we have decided not to surface the access path until after the 11th November, just in case anything delayed the works. In the meantime we are cutting back vegetation from around the fence line to the war memorial to open the fence up for furtehr inspection by prospective contractors for its restoration. Architects are presently working on plans for the revamp of the pavilion and hopefully work will start on this very early in the new year. Things have been a little quiet on the site works front for a while however a considerable amount has been happening behind the scenes. We have just completed tender information for the Hard Works contract covering access improvements, car parking and pathways. This is being sent out via the Staffordshire County Councils E-procurement website. For contractors interested in this work the Pre Qualification Questionnaire (PQQ) and full tender document along with more information is available from the Staffordshire e-procurement website at http://www.staffordshire.alito.co.uk/. The deadline for receipt of PQQ submissions is 2pm on 24th June and the tender reference is ST245. Detail proposals are now being worked up for the pavilion and will be tendered on a similar basis to the Hard Works contract later in the summer. Work has started this week on forming a base for a contianer, to be located adjacent to the new park compound. Once installed the area will fenced of with a post and rail fence and a new hedge will be planted along the fence and contianer side. Over the last couple of weeks some tree felling has taken place. Firstly trees have been removed or cut back to open up a view of the War Memorial from the new entrance way by the roundabout on Victoria Street. 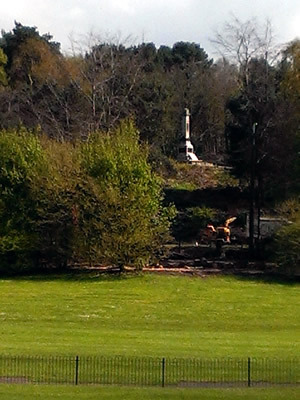 Having once been totally open to view the war memorial has over the years become hidden by tree growth. Work will start on forming a second sight line from the memorial towards the pavilion. Secondly, trees near the tennis courts and senior play area have been removed to allow for the cosnstruction of the new access track that will link from the end of the old main drive round to the car park off the Rugeley road. The actual work on the access link and car park will hopefully start around June this year. Some timber from the felled trees has been used in the making of thrones for the Maypole event later next month. The Forst of Mercia helped carve the thrones at a carving event and similar event is to be held in conjunction with the Friends of Hednesford Park on 27th April. The Forest of Mercia will be utilising most of the remaining timber for other activities or features. An architect has been appointed and will be working up detailed drawings for the pavilion refurbishment. Hopefully works to the buiding will start around June. At present we are working up detailed drawings and specifications for the new paths,access roads and car park layout. Once completed this will be going out to tender and hopefully work will start around June. Work started this week on removing some trees in two areas. The first was adjacent to the new tennis courts. This is to allow construction of the new access path from the end of the existing main avenue round to the car park and Rugeley Road entrance way. Secondly a start was made on creating one of the narrow sight line to the war memorial when viewed from the entrance way adjacnt the roundabout on Victoria Street. Some of the timber is being used this Saturday the 5th April in the park at the pavilion. The event is a Maypole Throne Making Course run by the Forest of Mercia in conjunction with the Friends of Hednesford Park, to make Maypole thrones for the reintroduction of the Maypole event that is to take place onn Sat 10th May. The cource is to be held on the 5th and 12th of April. The Council is holding a drop in session on Thursday 20th March fromm 11am to 8pm at the pavilion in the park. On display will be a 3D walk through of the park showing the proposed development together with images of the site before and after the works have been completed. All the planting has now been completed. This includes 29 large trees forming one side of the new avenue along the new access road, hedge planting along the fence line to victoria Street and areas of native tree and shrub planting adjacent the superstore and boundary with the TA building. 8 large pines have been planted that will eventally help to creeen or break up the gable end of the superstore particulalry when walking along the remainning section of the old avenue. Apologies for the late updates - still awaiting uploading of pics for the 18th update. Will be creating a separate page for the Signal box shortly that will cover its history and future restoration. If you have any recalculations of the signal box, photos etc we would love to hear from you, contact us via the email address above. All is progressing well to date with about half the avenue trees being planted together with the hedge and the native shrub area. All the planting works should be completed towards the end of this week. Whilst it will look good now, it will take 20-30 years to see the real benefit of the trees however we are hoping to have a 3D Walk through of the avenue and the park very shortly that will give an idea of what the whole scheme will look like. A start has been made today on the planting of trees along the new boundary fence to Victoria street and the Supermarket. This will form one side of the new tree avenue that will site either side of the access road. There will also be native shrub and hedge planting to help screen various buildings and frame important views. All work should be completed in a few weeks time. The first phase of tree and shrub planting is due to commence on site on the 17th February 2014. The planting works will consist of creating the first half of the tree avenue along the new access road adjacent to Victoria Street and the supermarket. The trees will be planted between the access road and the new fence line and will be accompanied by a hedge along the fence line. There will also be areas of native planting adjacent to the new TA base and to help screen the side of the supermarket. 3 ceremonial trees are to be planted, 2 red oaks representing the Local churches and the Armed Forces and an English Oak commemoration the Queens Jubilee. The latter from a seed from Winsor Park. The existing pavilion has been refurbished and expanded. The works see a new cafe, toilet/changing facilities together with a meeting room and balcony installed within the exiting roof. The scheme includes resurfacing of paths, restoration of fencing, gates and pillars, replacement of concrete slab step to memorial, removal and restoration of the historic landscaping to and around the memorial. The work will be carried out in stages by several contractors. Vegetation has been cleared from each side of the main path and also various patches of rhododendron that were spreading around the top part of the site, still a bit more to do. The areas either side of the path will be cleared of stumps and roots and leveled out for seeding. The latter to be carried out ASAP. The exiting loose gravel on th path and around the memorial base has been scrapped off and the good material saved for respreading on what will be an enlarged standing area to the left of the memorial. The former gravel areas have been excavated and graded out with clean stone ready to revieve the tarmac surface, which has started today and hopefully completed be the end of the week. A resin bonded gravel wearing course is to be laid over the tarmac surface once the latter has curred fully and other works to the memorial also completed. Work commenced last week on cutting back the vegetation either side of the path up to the large Yew and Holly trees. Prior to starting all shrubs were checked for signs of nesting birds. None found in the small bushes but several in one holly that was to be removed so this has been left. Clearance of Rhododendron nearer the top of the hill is continuing next week. The ground works contractor has made a start on the main path, clearing off the existing gravel and preparing base for laying tarmac base. The gravel will be used to create a larger standing area around the memorial. The first stage of the works will see the resurfacing of the main access path and area around the memorial, replacing the loose gravel with a resin bound surface and increasing standing area around the memorial itself. Some of the landscaping works entails replacing the over mature shrubs either side of the main path, which would generally be carried out in the winter. However this work entails digging out the shrubs and removing all the roots, which is potentially quite messy and likely to result in damage to the newly laid main path. Therefore we will be removing the shrubs as part of the path preparation works and leaving a tidy soiled area that can be seeded with a temporary seed mix till new shrub planting takes place in the winter. The first operation will be cutting down of these shrubs, which will be towards the end of week commencing 27 April. The tall Holly and Yew trees are being retained but will be reduced in height at a later stage. Removal of the roots and path preparation works will follow on in early May. This work will be carried out by the contractor presently constructing the new car park and roads within the park. New toddler/junior, senior play areas and ball court are to be built, the toddlet/junior area is to be located adjacent the pavillion on one of the former bowling greens. The senior play area & ball court including a Parcour will be located to the west of the bowling greens and tennis courts, where the present skate ramp and grass area are located. 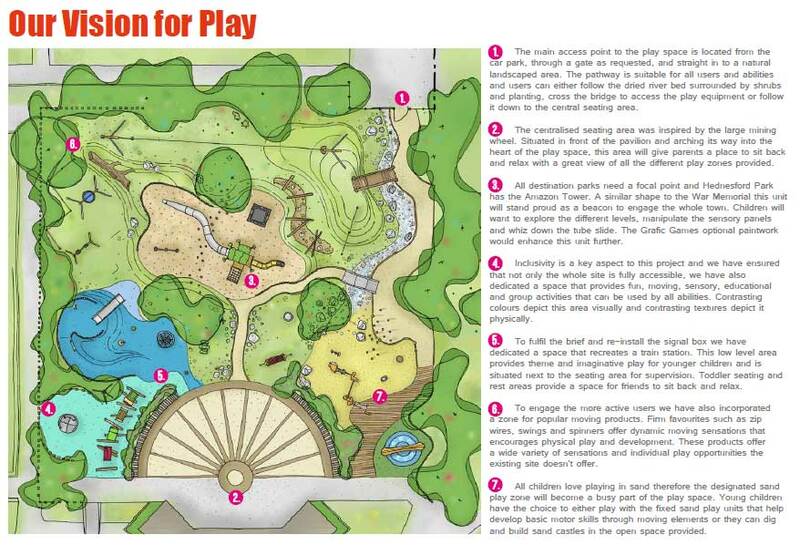 The proposed layout of the toddler/junior play area can be seen via the link at the bottom of this section. Once the all the new areas are completed the old ones adjacent Victoria Street will be removed. Work is due to start on the Junior and toddler area on Monday 3rd August. The contractor has started to erect site fencing this week to make the area secure. 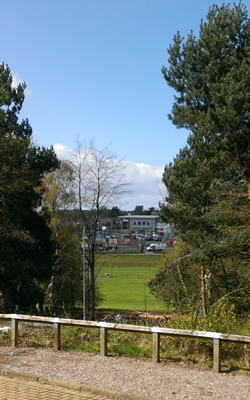 The site compound will be set up on the existing car park adjacent the tennis courts, this will unfortunateley mean that anyoune wanting to use the tennis courts will have to walk through the new car park extension and round the western end of the courts to gian access. A new wheeled sports area is to be created on the site of the exiting ball games area. This will replace the exiting metal skate ramp with a new purpose built concrete skate plaza incorproating facilities for skate boards, scooters, BMX and rollerblades. Consultation on the proposals will commence in Mid August, watch this space. Work is proposed to start in September with completion by December 2015. Welcome to the page devoted to the Hednesford Signal Box that has been relocated to Hednesford Park. We will develope this page to cover the past, present and future of the signal box including details of progress on restoration. hed-park@cannockchasedc.gov.uk or phone on 01543 462621 as all the information will go to help recording the social history of the signal box and its relationship with Hednesford. Glad to report that South Staffordshire College are helping in the restoration works via training experience in various crafts as part of the students courses and that they have made a start. The hole in the floor where the lever frame sat, has been boarded up and the modern suspended cieling is being removed prior to preparation for internal painting. New guttering has been purchased as well as various bits of wood to replace wrotten wood. Following the successfull relocation of the signal box on 16th Feb, Tom Walsh, Parks and Open Spaces Manager formerly accepts the Keys to the signal box from Trevor Wilson Network Rail's Project Civil Engineer together with Angus Watson - Balfour Beatty's Contracts Manager. A very large thank you must go to Network Rail, who donated the box and arranged for its relocation and also to Hednesford Town Council for contributing to the cost of the works. Network Rail have also provided a couple of the original signal posts that will be restored and installed near to the signal box. SIGNAL BOX - Very early on Saturday morning the signal box was lifted from its brick base where it was first built back in 1876 and carefully craned onto a waiting low loader by a 300 tonne capacity crane. The box actually only weighed under 8 tons but because of the long reach to get to the box the large capacity crane was needed. After being transported along Victoria Street and Rugeley Road the box arrived in Hednesford Park to be carefully lifted once more and swung high over the old bowling green and pavilion to its new resting place on the recently constructed brick base. After the lifting frame has been removed, contractors have boarded up the windows and temporary fencing installed around the box untill restoration work can start. Apart from replacing some rotten wood, installing new windows and having a lick of paint, some of the original signal leavers will be reinstalled which will hopefully be linked to a couple of the original signal posts from along the Hednesford to Rugeley Line. Thanks should go to Network Rail and Hednesford Town Council who have contributed both financially and with time and effort to the project. The lifting operation will take place from approximately 7am when the box will be lifted from its brick base and over the railway lines onto a trailer located at the rear of the new supermarket development. After securing the signal box to the trailer and derigging the crane both vehicles will then drive along Victoria Street and Rugeley Road to enter the car park adjacent to the tennis courts. The crane will reverse down to the pavilion followed by the trailer and after setting up the crane the signal box will be lifted over the pavilion into its new location. The offloading should start around midday dependent on progress of the first part of the operation. The Rugeley Road car park will be closed most of the sunday until the relocation has been completed and the crane and lorry have left site. Any further changes will be advised. SIGNAL BOX - Network Rail has advise that the move will now take place on weekend of 15-16th February weather conditions permitting. As noted below the actual lift and moving will take place from around 1am on the Sunday morning with the signal box being set in its new location before 8am. We have just been advised by Network Rail that the proposed relocation of the Hednesford Signal Box scheduled for this weekend 2-3 February has been cancelled. As soon as a new date has been confirmed we will let you know! Recent signalling improvements to the Walsall to Rugeley Rail line has seen the decommissioning of the existing signal boxes. Brereton box has recently been removed to the Chasewater Railway (Link) and Hednesford signal box is soon to be moved into Hednesford Park after agreement was reached between the Council and Network Rail. A new brick base has already been constructed in the park close to the existing pavilion adjacent the Rugeley Road . Originally it was proposed to lift the box from its present location at rear of the surgery on Station Road and off load it from the Rugeley Road onto the new base. However due to problems with road closures, it has been arranged to off load the signal box from within the park via the existing car park of the Rugeley Road. As part of the site access improvements and to allow construction access to the pavilion, a ramp is being constructed from the car park down to the end of the pavilion over part of the old bowling green . The construction of this ramp has been brought forward in order to -provide access for the unloading of the signal box. The actual lifting and moving of the signal box will take place in the early ours of a Sunday morning, between midnight and 8am, when there is a closure of the railway line. The operation is now programmed to take place on the morning of the 2nd February. Please check back just in case things change! You can download the access improvements plan below.